This was supposed to be a grand tourer, so why is it so balanced on the track? Chris Harris has finally gotten around to driving the Aston Martin DB11. Or rather, the Aston Martin DB11 has finally been graced by the discerning eyes of Chris Harris, and it’s more than time. The new DB11 has been out for a bit now and it’s time for a solid report card to see how the leader of Aston Martin’s charge into the future shapes up. Right away it’s apparent that this is a grand tourer and not a Porsche 911 competitor. Good, because grand touring cars is what Aston Martin is known for. 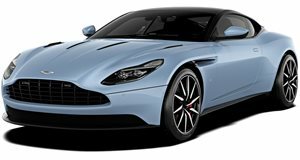 Though this isn’t the flagship Vanquish, it’s nice to know that you can still get the experience in a smaller package. That’s not to say that the engineers didn’t think about what would happen if a driver just so happens to want to take it to a track and get it sideways. According to Harris, buyers be pleased by “the best Aston Martin chassis” he’s ever driven. Despite a wet track, or maybe because of it, the Aston is incredibly easy to pitch into a drift. The surprise comes once opposite lock is engaged because that’s when the differential kicks into place, ensuring the 600 horsepower coming from the V12 is going to the proper wheel. It's in this space that the DB11 comes clean as one of the better sports cars Harris has driven, perhaps because of the Lotus engineer who had a hand in its development. This tire-smoking hooliganry makes it tough to see who’s the better artist, the Aston engineers who built the car or Harris as the drifting maniac.